Whether you’re jump-starting a business idea, launching your first startup or looking to scale your company, having the financial resources and the right investors are critical components to hitting milestones and reaching maximum growth potential. According to a recent survey from Ernst & Young, out of more than 1,000 entrepreneurs surveyed, over two-thirds said they found it challenging to find the capital they need to grow. Since the launch of Hockeystick Database last year, it has been used for research and collaboration to help companies scale. Hockeystick Database was built to fulfill our company’s vision of a completely open and free database that is accessible to all. Learn why we launched Hockeystick Database from our Founder. The database provides entrepreneurs with the research platform to search, track and analyze the companies they are interested in. It offers multiple features, including exporting search result lists to Excel or CSV formats for individual analysis and generating custom lists of organizations to your preference. Before beginning your search, determine which type of funding is right for your business. What type of program or investor will provide your company with the right tools and resources needed for growth? 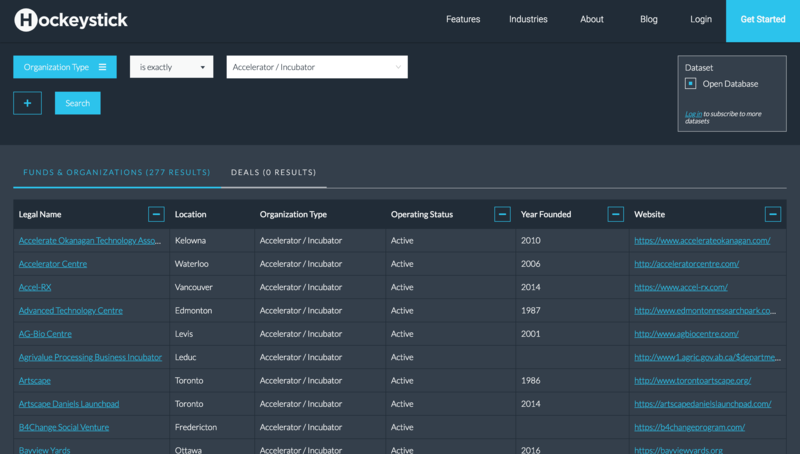 On our homepage, Hockeystick Database displays information widgets broken down by provinces, investor type, as well as resources that are available to your business. 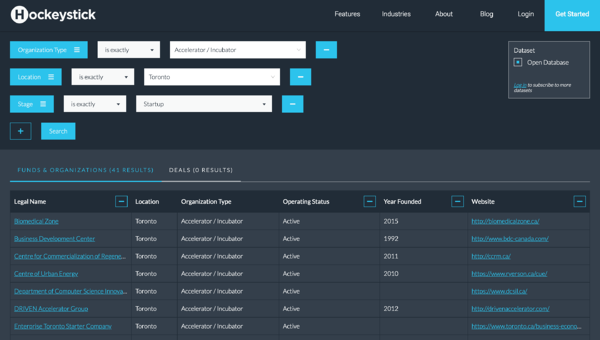 A full list of the funds and organizations can be viewed once a widget is clicked on, along with further filter options that you can choose from. As an entrepreneur, attracting attention from the right investors and program managers can be the most difficult aspect of starting a new company. This will lead you to a full list of your target venture capitals. Click on each name to view their company profile. You can even look through the involved parties section to see what type of companies the VC is mostly investing in. Accelerators play an important role in improving a startup’s outcomes, but not all accelerators are created equal, that’s why finding the accelerator that is right for you is key. You now have a full list of target accelerators. You can click on each company name to view their profile page. The company profile contains basic information like year founded, a brief summary and social media handles. If you go to the program info page, you can see the different programs that the accelerator offers. Read the program description to see which one interests you and would fit your company. To apply for a program, simply click on the application link provided. Government funding is another source of financial leverage that can help entrepreneurs grow their companies. However, the process of applying for government funding can be both complicated and intimidating. A study found that 43% of entrepreneurs say finding the right investor remains the biggest challenge facing their startup, and more than half haven’t accessed government grants. With over 569 government programs on our database, there’s a variety of programs to fit your business’s needs. Let’s say you own a fintech company. To find a list of government programs that may interest you, click on Government on the homepage dashboard. To view available federal governments, simply create a filter for locations in Canada. If there are too many options you can narrow down your search to view only provincial government programs by changing the location filter again. Knowing your competitors and what they have to offer allows you to stay one step ahead and helps you clearly define your value propositions. With Hockeystick Database, you can view all of the basic information your competitors have on their profile, including a description of what they do as well as their social media handles and involved companies. To begin researching your competitors, go on to the “Advanced Search” tab under the search bar on the homepage. 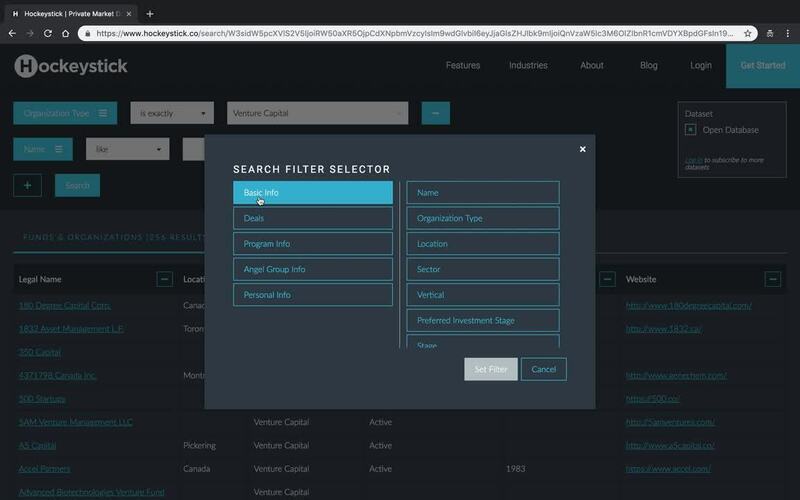 Create new filters depending on what aspects of your company you want to compare with others. 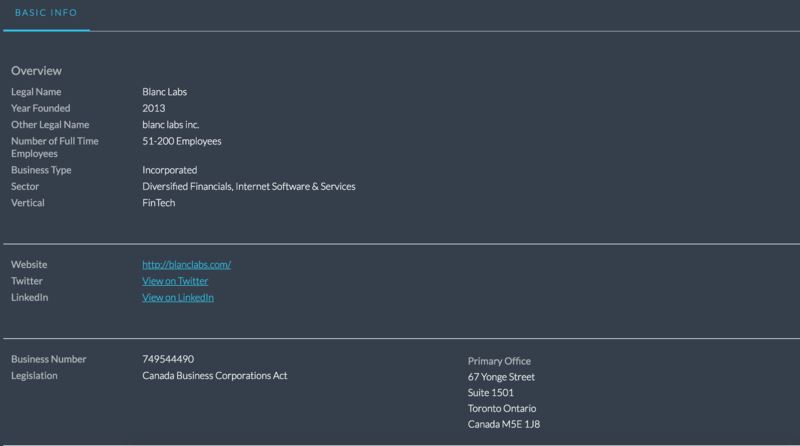 If you own a Toronto-based startup analytical company, set filters based on the vertical, location, and company stage. Getting your company profile onto the Hockeystick website offers numerous benefits, including greater exposure and visibility. Your data will help us continue to improve our ecosystem, generating meaningful insights and better returns to further your company’s growth. To begin the process of adding your profile, reach out to us at support@hockeystick.co. After your company has been approved by our highly-skilled data team, you can build your company’s profile and continue to update your page. Every entity on the Hockeystick Database owns their data and has the exclusive right to modify it. “Our vision is to provide the most complete, accurate and up-to-date view of the entire private market,” Raymond Luk, Founder and CEO, Hockeystick. In this constantly evolving world of tech, we are dedicated to continuing to deliver powerful data analytics, insights and tools for entrepreneurs at every stage of growth. 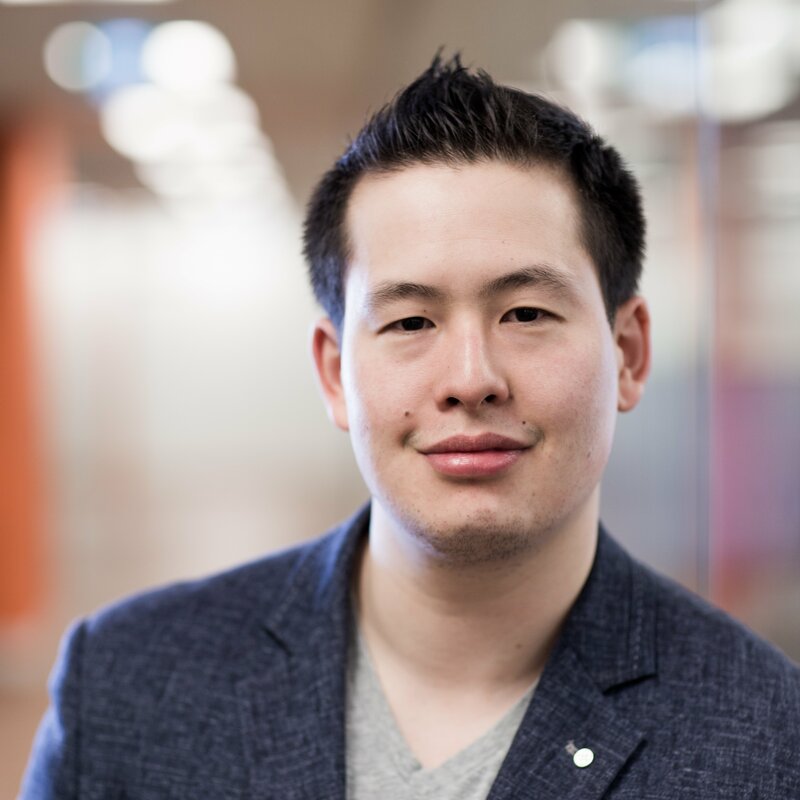 Will Tang is the Head of Sales at Hockeystick. Will has spent his career working with high-growth software companies. After starting his career as a consultant, Will assumed leadership roles at a number of software companies where he was responsible for building and managing teams of highly skilled sales professionals. Previously, Will spent many years in the financial services industry, which with his love of finance, brought him to Hockeystick.